Bad: Hides its true face and not everyone might find it. 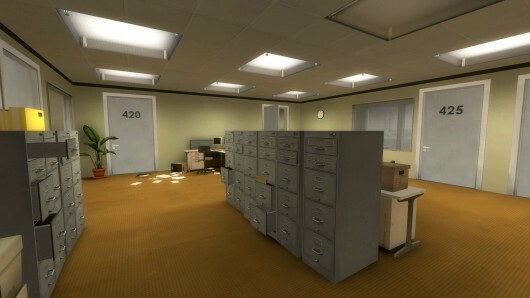 The Stanley Parable, a game that started its life as a Half-Life 2 mod and has become one of the latest indie sensations. Although if you ask certain people, they probably wouldn’t exactly call The Stanley Parable a game, but more an interactive experience the likes of “Dear Esther”. 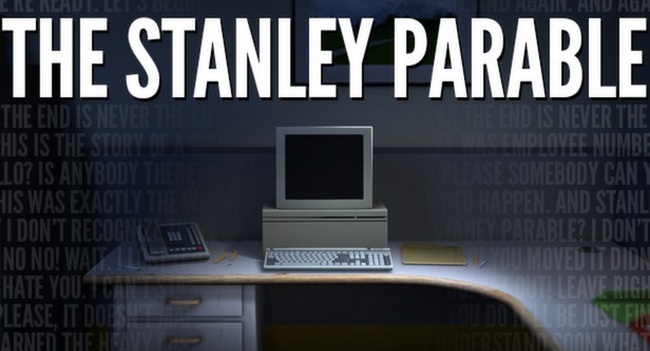 Whether they’d be correct or not we’ll leave up to you, but here’s what we think about The Stanley Parable. 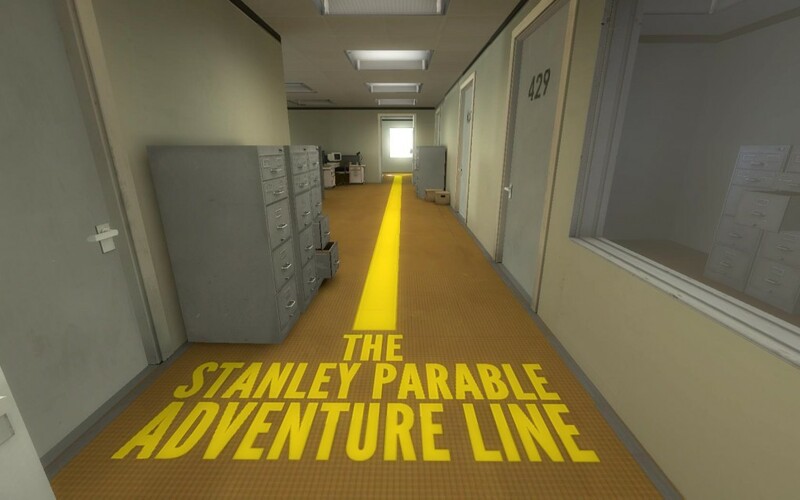 The Stanley Parable tells, as the title implies, the story of Stanley. Stanley is a not so special man with a not so special life, who works a not so special job. Every day he sits at his computer, and follows commands that appears on his screen without really thinking about it. Then one day things change. When one day, Stanley doesn’t get any more commands on his computer screen. What’s even stranger is that his entire office building seems to be abandoned. 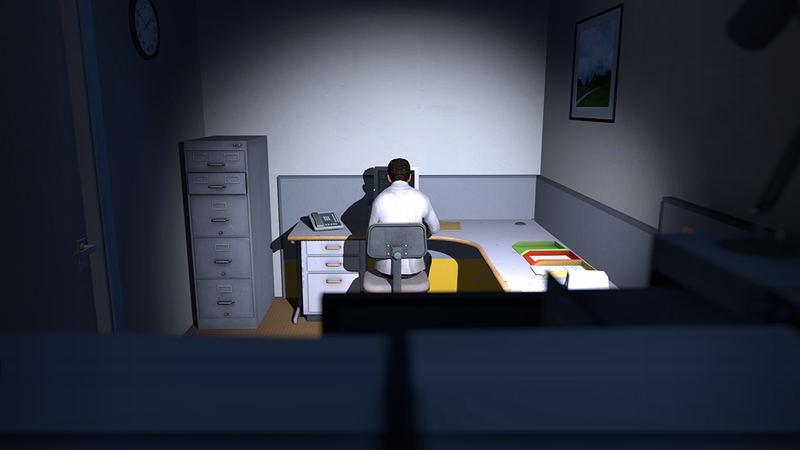 Compelled by a guiding voice, Stanley decides to leave the safe haven that is his office and goes to look for answers. That’s the basic premise of the game’s story and it can at the same time be the most important thing in the game, or completely obsolete and insignificant. This might sound very weird and bad but it’s part of what makes it very unique and an amazing experience and comment on modern game development. The guiding voice or narrator I mentioned earlier serves as a medium through which you find out more about what happened. This forumulae works amazingly well. This is mostly thanks to the brilliant and genuinely funny writing of the developers. There’s a lot of material written for the narrator and most importantly, of a consistently high level. This is something we don’t often see in games nowadays and thus it provides a pleasant change. As mentioned before, the Stanley Parable was originally a Half-Life 2 mod, as such it still runs on the source engine. Even though Valve has done a nice job in the last few years updating it, you can still tell its a nine year old engine at its core. Still the game looks completely acceptable and has a nice and extensive graphics menu despite not being a heavy game for your PC, nor does it rely much on its graphical quality. The upside to all of this is that you can make the game run decently on just about any system out there, which is always a nice extra. In short, don’t expect a graphic masterpiece but expect a game that looks fine and runs smoothly. This is one of the areas where this game really ‘shines’. While playing through the game, everything you do and everything that’s happening is commented or told by a narrator. He is the only talking character in the game and truth be told, the voice actor they hired for the part just nailed it. It wouldn’t be an exaggeration at all to say that the narration is a big part of what makes this game so great. The writing is good to start with but there’s been plenty of examples in the past of good writing being completely ruined by crappy voice acting. But now, every line is just brought perfectly and the storyteller does a great job in creating a great atmosphere in a very atmosphere driven game. Ok, slight warning up front. This section of the review is going to contain some things that some people might consider ‘spoilers’. I thought long and hard about how to avoid this but I don’t feel like there’s a way to explain what makes The Stanley Parable so great without talking about certain aspects of the game. So for those among you that don’t want any spoilers about the game just trust when I say that it is totally worth playing the Stanley Parable. Be warned though, not everything in the game may be what it seems. Gameplay wise Stanley Parable is pretty simple, you just walk around, follow the narrators instructions and eventually you’ll reach the end of the game. If you’re really fast it will take you about ten to fifteen minutes. A lot of you will think that doesn’t sound too amazing, and you’d actually be right BUT the true genius of the game opens up to you when you discover you don’t have to follow the narrator’s instructions. A great example of this is at the beginning of the game there is a room with two doors in it. If you just do as the narrator says you take the left door, follow the standard story and get to the ending. After that you will get a loading screen and end up right back at the beginning. Modern game logic has taught us to always follow the indicated path, do what the story says and not to deviate. The main question is: What if I stop following the yellow brick road? The moment you decide not to follow the narrators directions, is the moment that The Stanley Parable stops being an interactive story and becomes a real game. Especially one that becomes even better when the narrator starts commenting and reacting to you for not doing what he says. It makes it evolve from a simple game about a man trying to find out where his co-workers disappeared to, into something that’s a funny and brilliant commentary on games and modern game development. It’s this aspect that makes The Stanley Parable a great and genuinely interesting experience. An experience gamers could truly appreciate. As far as pure gameplay goes the game is very simple: you have your four movement keys and a key to interact with objects. That’s it, and that’s all there needs to be to keep The Stanley Parable a great experience. In the end The Stanley Parable is more than meets the eye, it’s a great experience that is hidden beneath a game that might seem simple. With its great writing and voice acting, it creates a great atmosphere. With all these factors combined, it becomes a great commentary on modern games and game design. As mentioned before, think about straying from the path that was laid out before you. Yeah it really has some of the best writing I’ve seen in a game in a long while ;D humour’s a hard thing to do in game’s but this one really nailed it!